Rip out the old caulk. 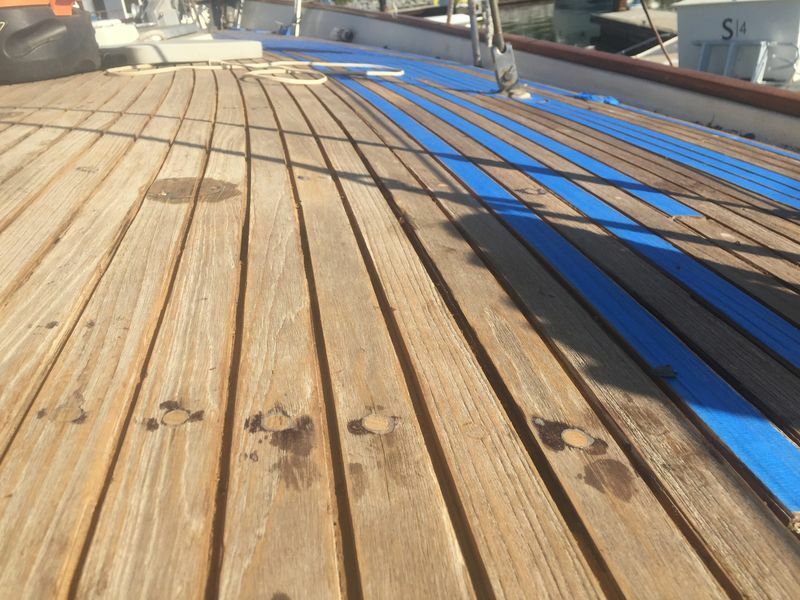 Clean up the grooves between the planks, possibly deepening them since the planks have worn down a bit. So, the guys showed up two weeks ago Monday, and started tackling the caulk. It is a pretty manual process, using modified chisels and screw drivers to scrape and rip out the caulk. These screws were identified as needing to be replaced, but we didn't have the bungs yet. So the heads were cleaned up so a screwdriver would bite, then backed out slightly as an identification of which ones needed to go. 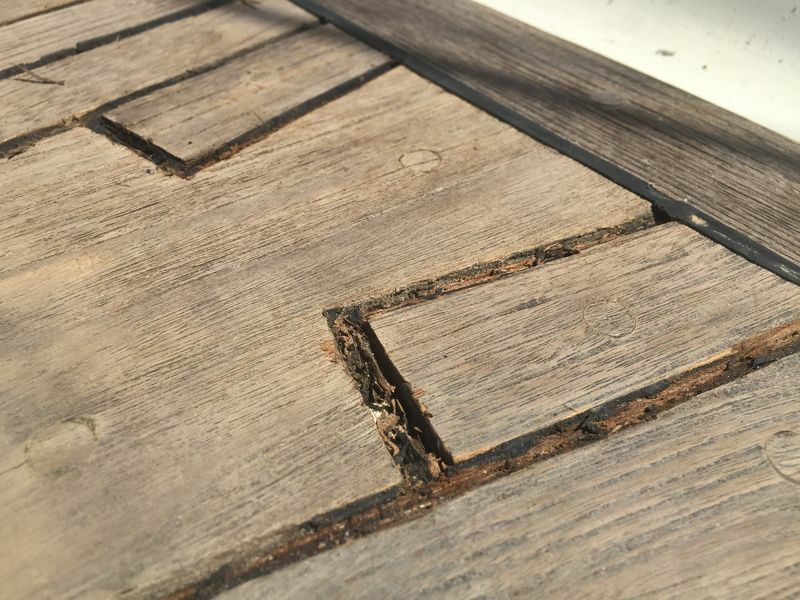 The edges of each board were slightly proud from the proud caulk, so they had to be knocked down a bit with sand paper. Clearing the caulk, replacing screws with failed bungs, and sanding the edges took about a week, with a crew of between two and four guys. 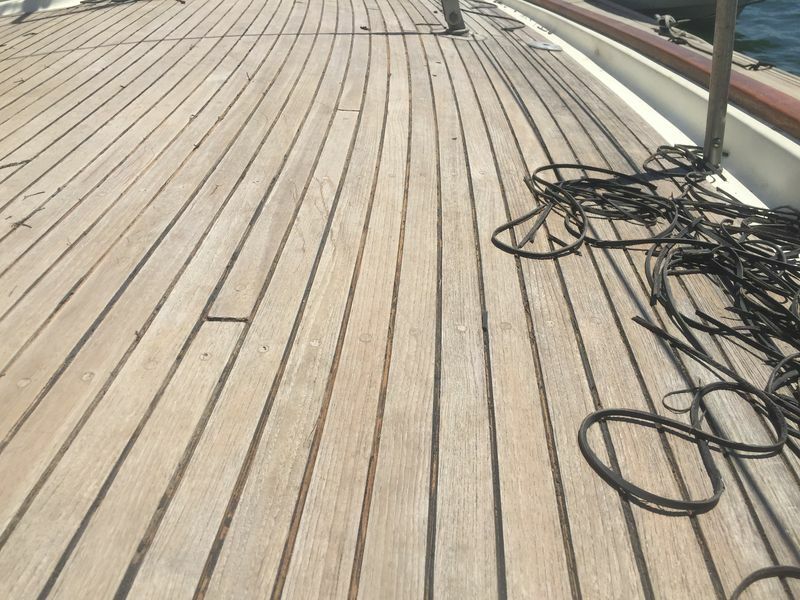 The following week a crew of carpenters showed up to route out each groove, making them deeper so that the caulk would stick sufficiently to the sides of each plank. They used an interesting guide for the router. 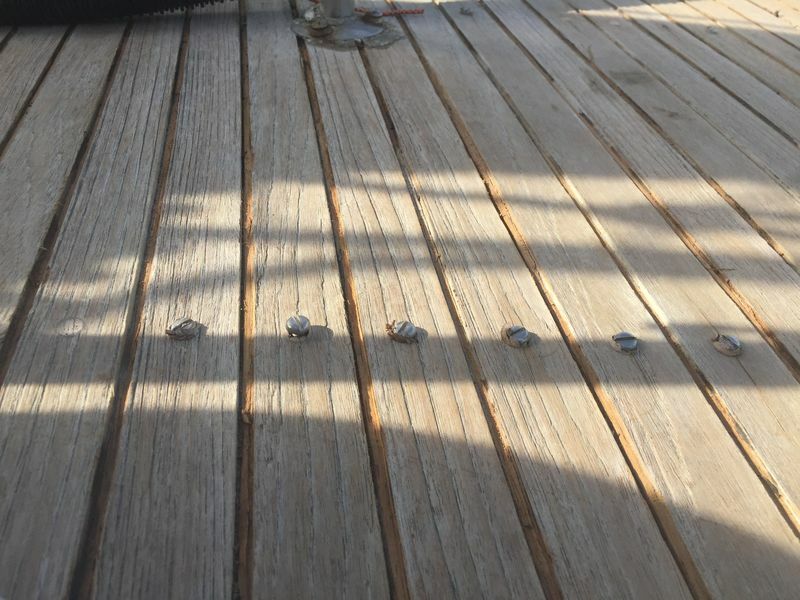 The router was placed in a groove, then a long board with several short boards sticking out at ninety degree angles was placed against the router. 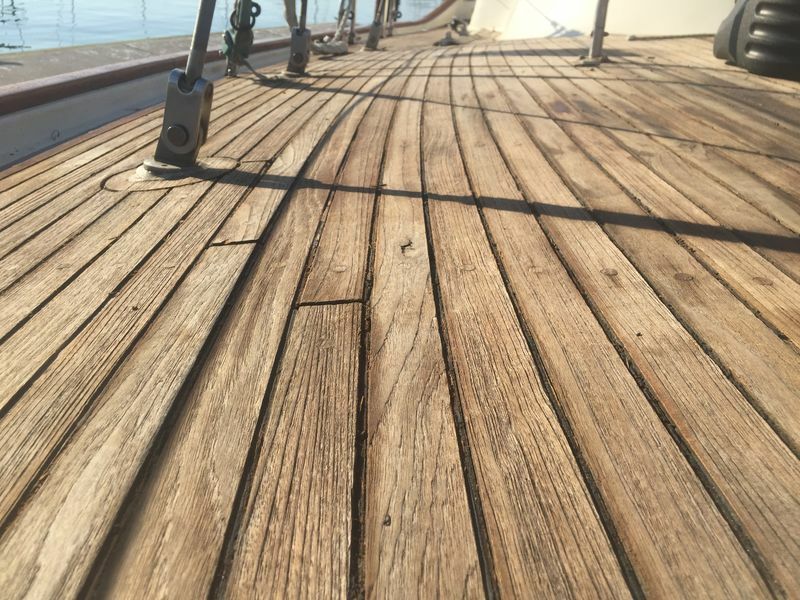 The short boards where then screwed into adjacent grooves on the deck. The screws held the guide in place to ensure a nice clean routing. 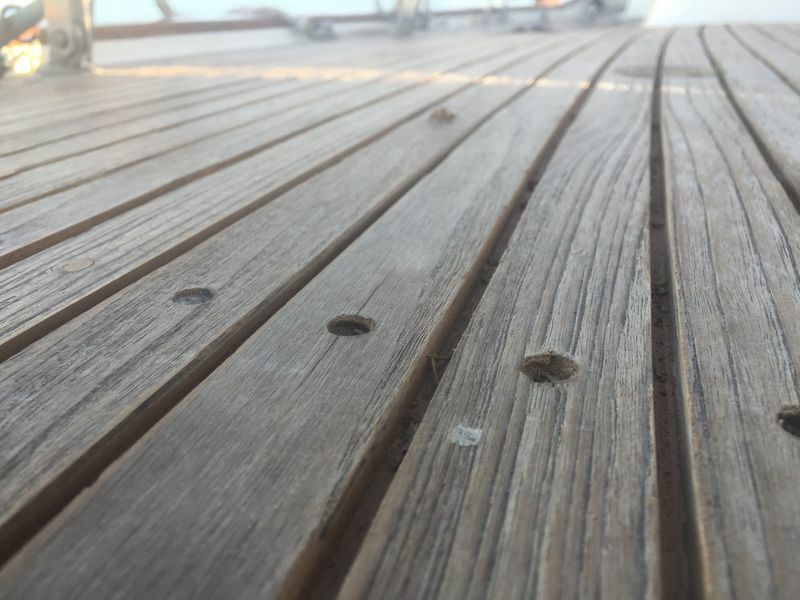 Once a section of the deck had been all routed out, a guy would back fill the little holes with a bit of epoxy to seal the deck in case the new caulk failed and water entered the grooves in the future. 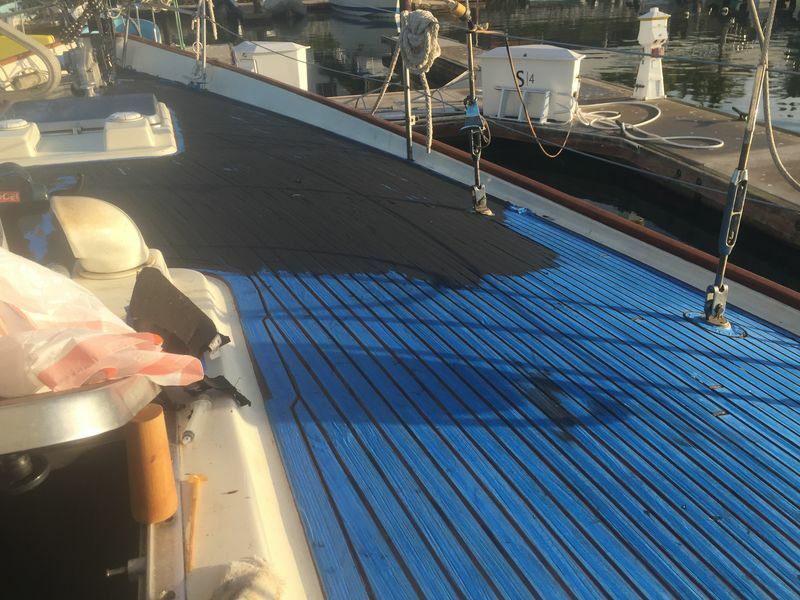 If there was exposed fiberglass, like in the picture above, the entire section was epoxied to ensure a good watertight seal. Above you can see the routed grooves up against the original grooves. It is quite a difference, and the caulk should stick around for quite a while. 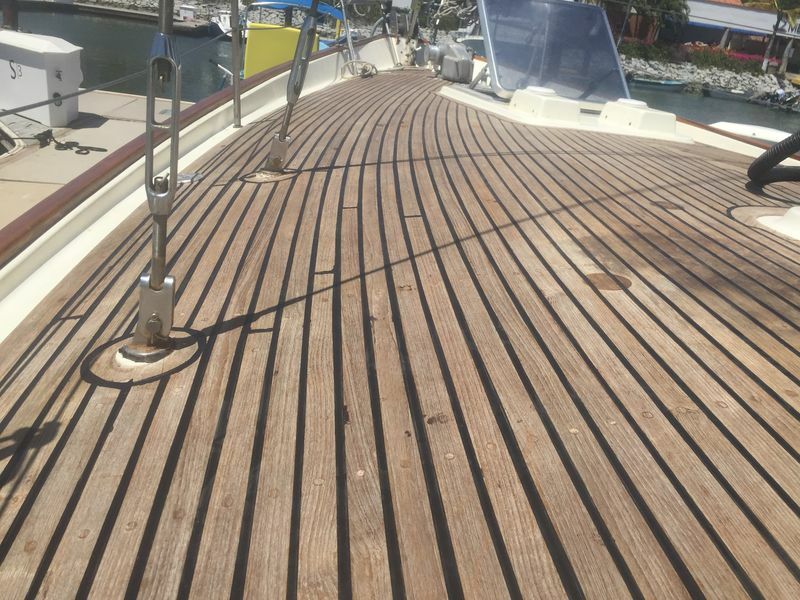 Also a huge benefit is that the boat has been hot and dry, so the planks have dried and shrunken a bit. 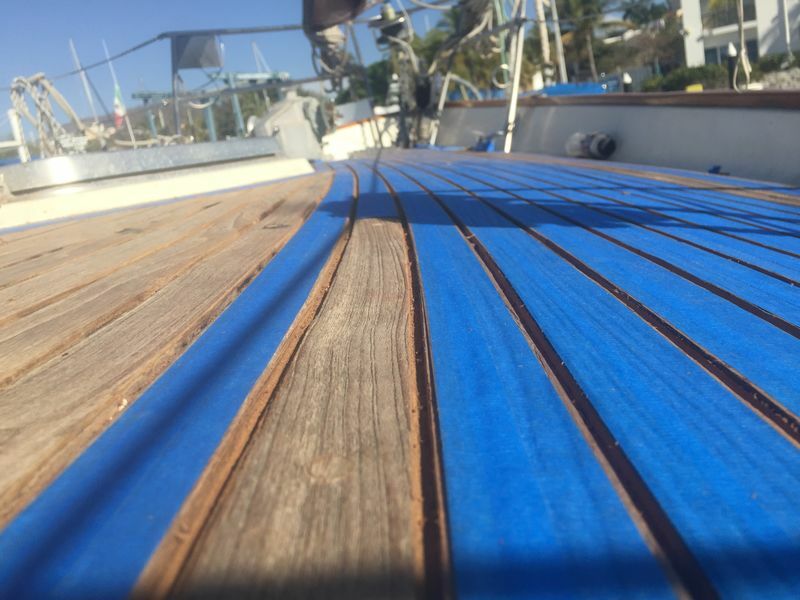 Thus when the boat is in a wetter environment, the boards will swell and keep the caulk in compression. 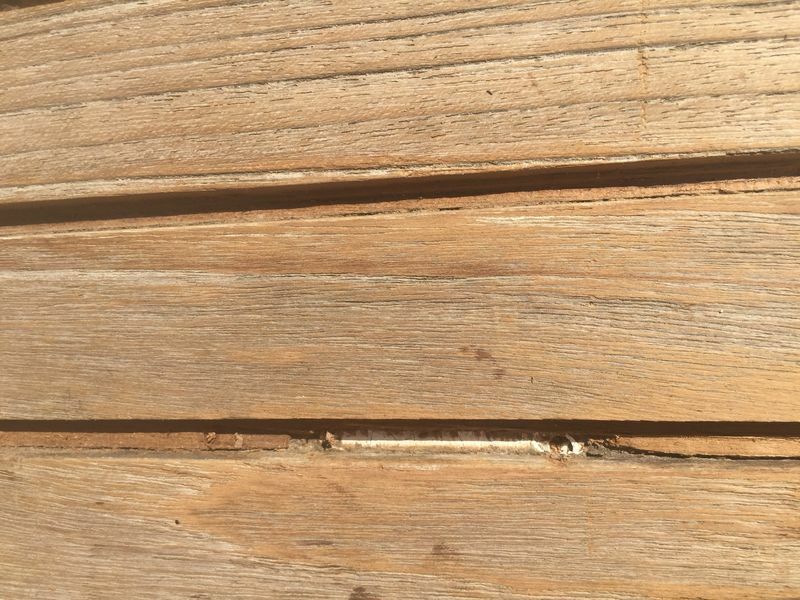 The taping process was exact, leaving about a millimeter of each plank exposed so the caulk is sure to grab the edge of plank. 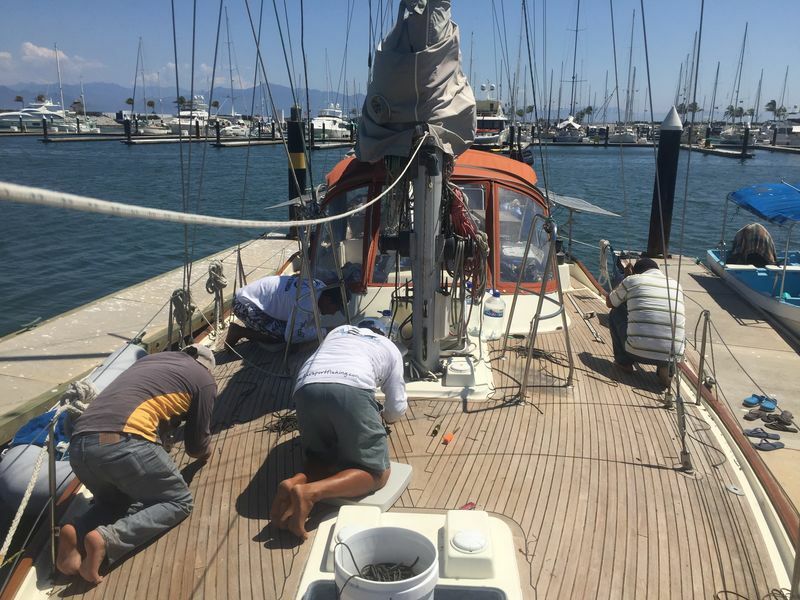 After the tape is removed, the guys will very lightly sand the planks just enough to get rid of the excess caulk and the epoxy bleed out from replacing bungs. 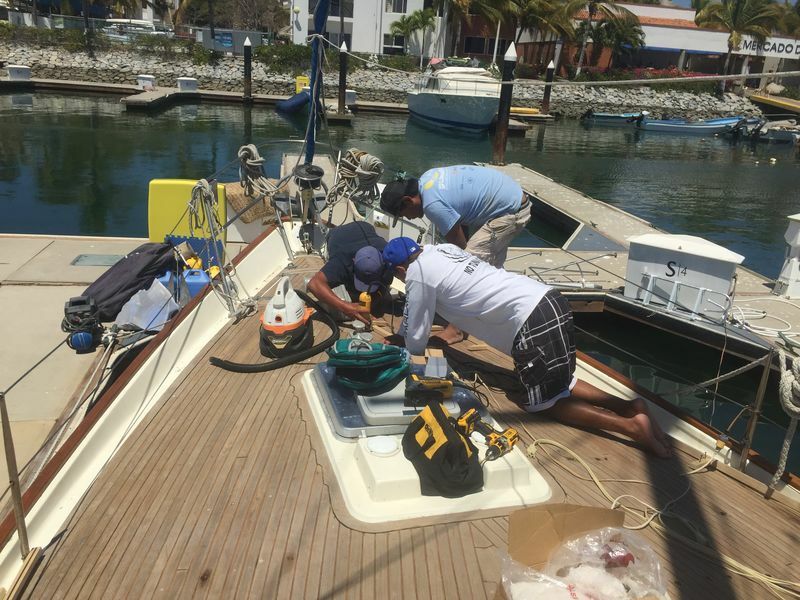 The caulking compound is pretty messy, but these guys did a really great job of keeping the rest of the boat nice and tidy. 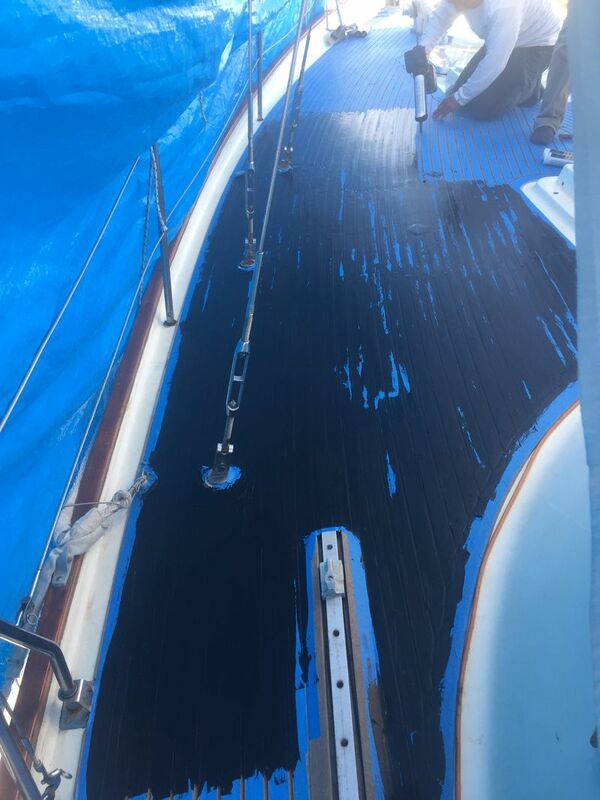 The only caulk mess I saw was due to one of my kids stepping in the wet caulk and traipsing around the boat. This section has been al caulked, and taped removed. 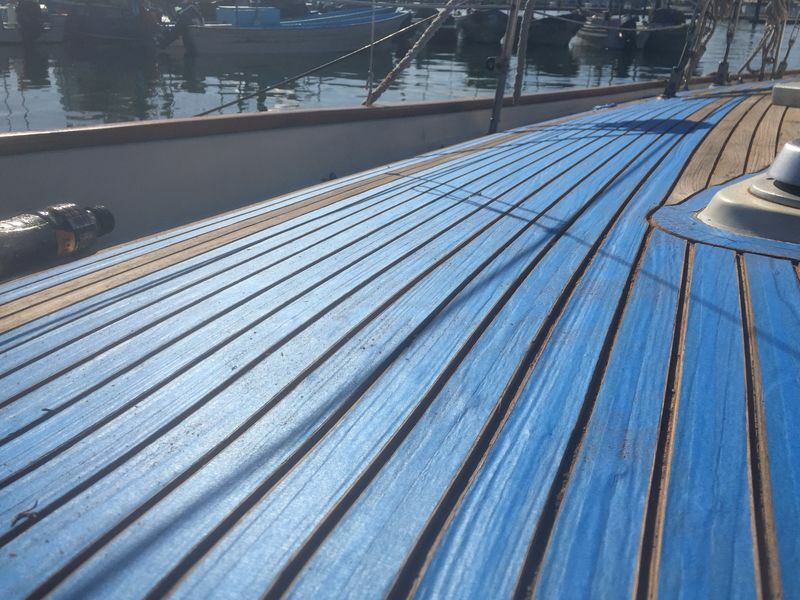 The only thing left is sanding, which began today! We should be done by Wednesday. 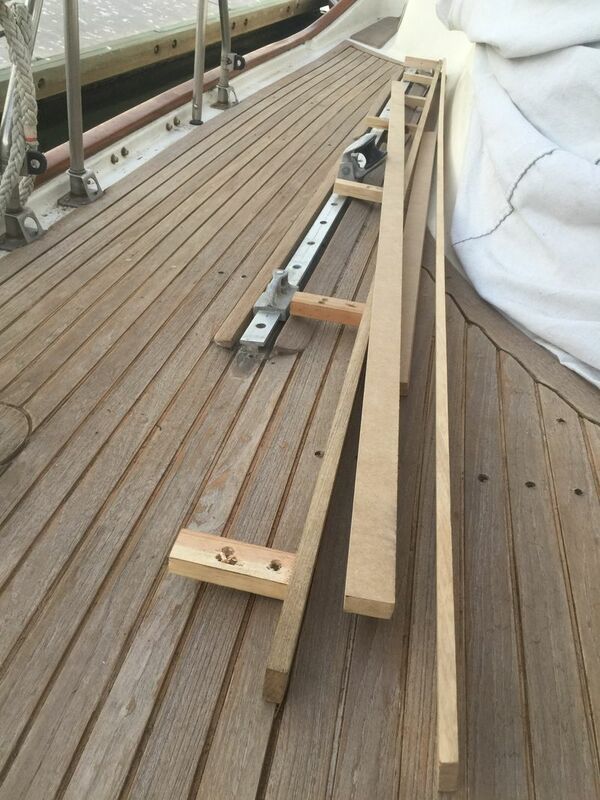 After the job is complete, we will install the deck hardware we had to take off, and off we go. Well, as "off we go!" as we get, which means we will surely be here until at least Friday, possibly later. 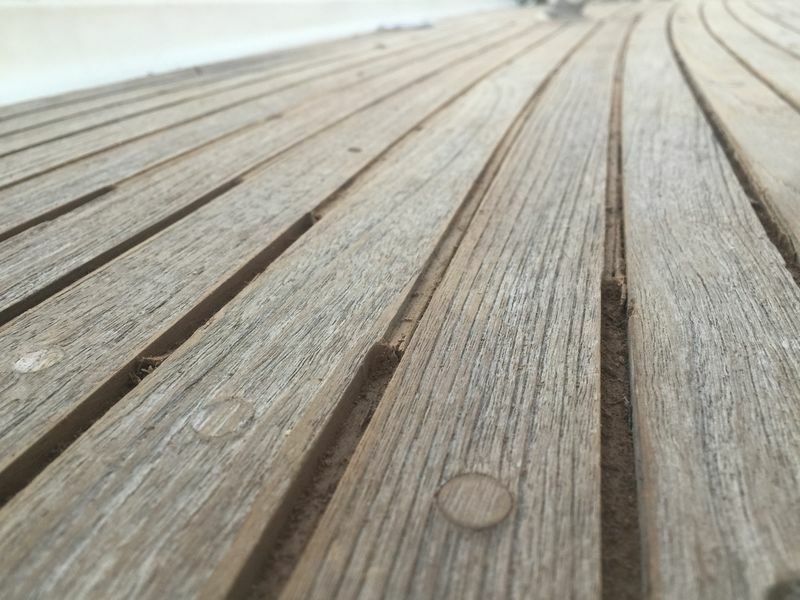 I am excited to have a nice deck!